In 2011 Benoît Peeters hosted a series of six sessions in the Centre Pompidou (Paris). These conferences will provide an opportunity for dialogue pushed between Benoît Peeters and personalities from the world of art (as the authors François Schuiten and Jean-Marie Apostolides, the composer Walter Hus and many others). All these meetings will be preceded by the screening of films and documentaries that will both cement and introduction to the conferences that will follow. The session held on November 30, 2011 was named Archifictions. Architecture supplies the literature (e.g. Species of Spaces by Georges Perec The House sheets of Mark Z. Danielewski), movies, comics and art. Sometimes, it ceases to be realized even to be pure fiction. Benoît Peeters met François Schuiten (designer of the Obscure Cities albums and stage designer), Philippe Rahm (architect and artist) and Didier Faustino (architect and artist). The session started at 18h30 with showing the following movies: Projection de Urbicande (2003, 7’) de Simone Bücher, de Exploring Dead Building (2010, 13’52’’) de Didier Faustino et de Météorologie d'intérieur (2008, 3’37’’) de Philippe Rahm. The interviews started at 19hrs. Interview with Benoît Peeters about this event. The interview is in French. Wednesday, October 19th at 19h Dialogue Benoît Peeters and Michel Gauthier (art critic). Conference around the work of Benoît Peeters. 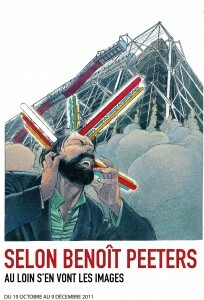 Meeting preceded at 17h in the projection of the feature film of Benoit Peeters: The last plan. Monday, October 31 to 19h On the occasion of the film on Tintin meeting Benoît Peeters , Jean-Marie Apostolides author of The Metamorphoses of Tintin and Tintin in the skin ,Pierre Sterckx , and Jaco Van Dormael . The meeting will be preceded by the projection -Moulinsart Holywood. Tintin film, documentary from 1995 directed by Benoît Peeters and Wilbur Leguebe. Wednesday, November 9 at 19h Dialogues with Benoît Peeters , Marie-Françoise Plissart , Stéphane Lambert and Olivier Smolders. Meeting preceded by a projection of Atomium in / out and travel around my room , two 26-minute film. Wednesday, November 16th at 19h Meeting about Paul Valery . Dialogues between Benoît Peeters , William Marx , Delisse Luc and Jean-Christophe Cambier. Session preceded by the screening of Paul Valery Pierre and Dumayet Robert Bober. Wednesday, November 30th at 19h Dialogue Benoît Peeters , François Schuiten , Philippe Rahm and Didier Faustino. Meeting preceded by the projection of Urbicande Simone Bücher. Friday, December 9 at 19h Meeting between Benoît Peeters , Jacques Samson (specialist in the work of Chris Ware) and composer Walter Hus (who prepares an opera adapted from Jimmy Corrigan).The meeting will be preceded by the projection of Chris Ware art of memory , a documentary by Benoît Peeters of 26mn.